I’m a big fan and regular user of double-pointed needles (DPNs), especially for socks because then I don’t need stitch markers, but I completely understand how daunting they can appear to knitters and non-knitters alike. “Fiddly” is the word I use when explaining DPN use to my knitting students. To be sure I’m using it correctly, I looked up the definition: “complicated or detailed and awkward to do or use.” Or, as the good folks at Merriam Webster say, ” requiring an annoying amount of close attention.” Annoying. That sounds about right. 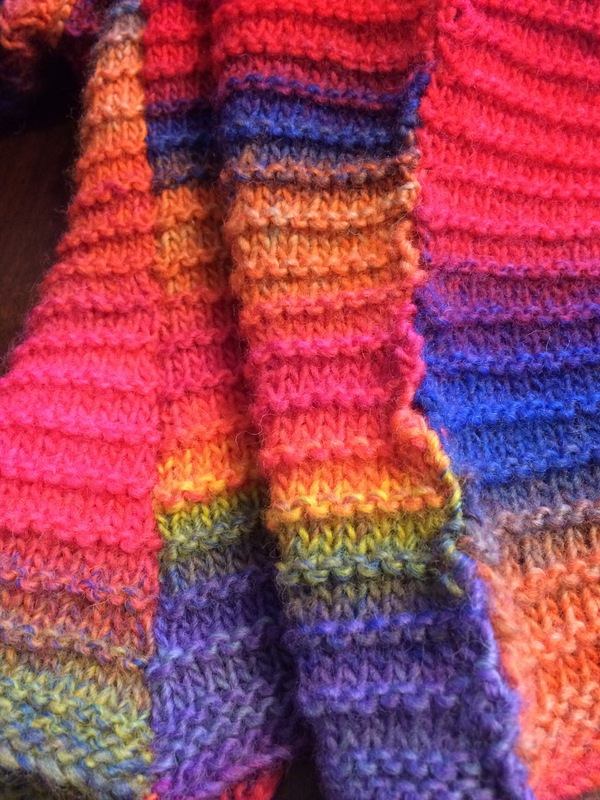 At last week’s Knit 101 class, Lisa learned to pick up and knit sleeve stitches using DPNs. And, true to the definition, she found it (annoyingly) fiddly. “Aaargh, I can’t do this,” she exclaimed after her first stitch. Her first stitch! I encouraged her to breathe and try another stitch, reminding her that she was only knitting with two needles. The other two needles, dangling nearby and holding 2/3 of her stitches, were just hanging out, waiting until she finished with the stitches she was working. As you can see, she got the hang of it pretty quickly and finished wee sleeve #1. Since baby’s arms are so short, a short sleeve was in order. Wish I could remember the yarn she’s using. Isn’t it fun? I’ll look it up and will update soon. In other DPN news, I’ve started the sleeves on the Sunshine Coast sweater. Now that the warm weather has finally arrived here in the Boston area, it’s time to get this finished. The sock is done and looks quite nice. It’s a bit big for my foot, but it’s not meant for me. I don’t know the eventual recipient yet, but I know it’s not me. That’s not a problem. Here’s the problem: I’ve come down with Second Sock Syndrome. Instead of casting on this sock’s mate, I’ve fallen for a clever yarn and the prospect of a baby knit. The trigger was the arrival of an invitation to a baby shower for a marvelous young woman, who’s also a first cousin once removed. As soon as I learned of her pregnancy, I began thinking of what to knit the lucky baby-to-be. What? That’s not the usual reaction to pregnancy news?! Before heading to Mom’s house today, I zipped to a nearby yarn store and grabbed a skein of Hayfield Baby Blossom DK. It’s patterned but not exactly self-striping and knits up with banners (kind of like stripes) interspersed with little flowers. I’m just getting started so you’ll have to trust me on this one. As for the Second Sock — you’ll have to trust me that it’ll get finished someday. I promise to share. I haven’t knit anything baby-ish in a while, but the Gidday Baby sweater (Tosh DK in Leopard and Maple Leaf) and reminds me how enjoyable such projects can be. 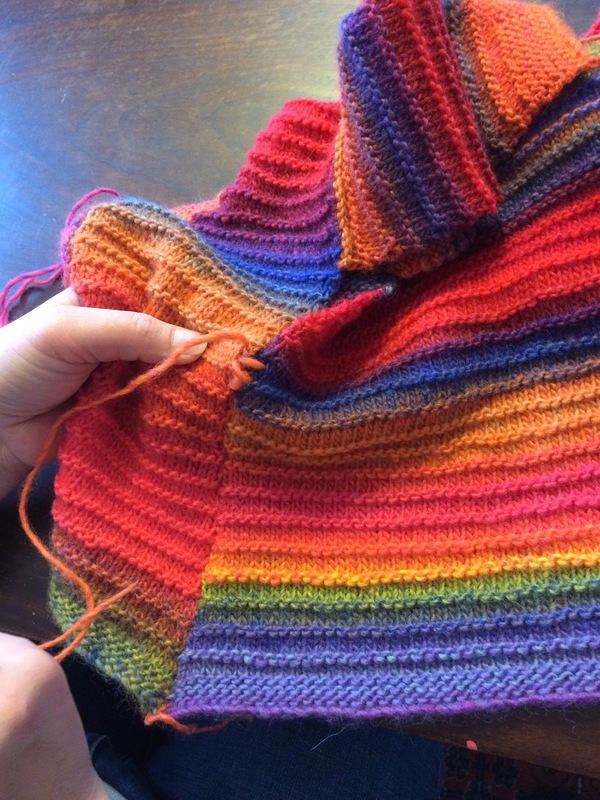 Starting with the first few rows of garter stitch in alternating colors, I was hooked. My recent spate of travels gave me lots of opportunities to work on the sweater — with the exception of my ill-fated Kentucky trip during which I found myself without the necessary next ball of yarn. In case anyone’s still wondering, my suitcase did arrive at the hotel — about an hour before I checked out and headed for flight back to Boston. Better late than never and all that. Once I’d cast off and woven in the few ends that remained, I tossed the sweater into the sink for a pre-block soak. I’m a full-water blocker, preferring it to steaming, assuming that I’ve got the time, which I generally do. After I patted it into shape, I left it in the sunshine for a while. Something was missing, namely a couple of tiny buttons to hold the yoke together. So the sweater and I spent about 15 minutes at a nearby yarn store trying on different buttons before deciding on these stylish, square-ish pair. It’s all come together quite nicely, and I’m looking forward to walking it down the street to my newest neighbor. There’s a new person our street, a baby girl born last month, and that is a cause for celebration! And how does (this) one celebrate a new life? By knitting something small that isn’t a pair of socks. I showed what I consider remarkable fortitude by searching through my stash for yarn with which to make something for this new little one. It would have been much, much easier and more efficient to spend an hour at my local yarn store, perusing patterns and buying yarn. As much as I love to boost the local economy and support a local business, I’m trying to exercise some financial discipline when it comes to yarn. Plus there’s the space issue: how many plastic boxes of yarn can one person have? I’d already decided against a traditional pink, preferring to go with a blend of bright and neutral colors. Gidday Baby by Tikki Knits seemed like the perfect match for the two skeins of Madeline Tosh DK that I bought last summer at the lovely fLoCk on Nantucket. On my flight to Philadelphia this past weekend, I cast on and worked a few rounds. Switching colors every two rows and bringing up the yarns along the side made for quick knitting. Of course, after two rounds of 20+ stitch increases, my pace slowed a bit. On the train down to Washington on Sunday afternoon, I managed a couple more rounds after doing some prep for client meetings. I think I’m going to like this project. After several years of having 6 to 8 knitters around the table at each knitting class, I find myself with two very small sessions this fall. I don’t know what accounts for the change, and I’m not taking the lack of enrollment personally (at least most of the time!). What these regular Fearless Knitters lack in number, they more than make up in their creativity, persistence, good humor, and ferocity. Discover a mistake (or many) a few inches into your circular scarf? Realize that the pattern on your stranded sweater is off by a few stitches? Learn the painful lesson that knitting while drinking red wine is not for the faint of heart? (Don’t pretend you don’t know what I’m talking about!) These knitting students tackled each project and challenge with vigor and commitment. Christy, she of the Fox Cowl Hood, recently finished a luscious braided cable cowl. The yarn and pattern are from Purl Soho. 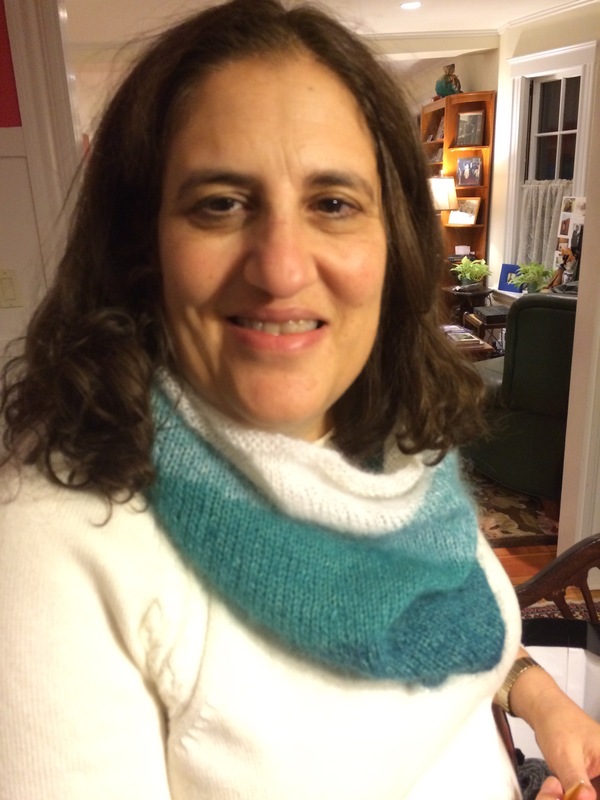 With the temperatures dipping below freezing here in Greater Boston, you can bet this cowl will get a lot of wear. Gillan’s half-way through a pair of chunky fingerless mitts. The pattern had both of us flummoxed for a while. (And by a while, I mean we each knitted and ripped it back two or three times!) Following it carefully resulted in two rounds of ribbing around the thumb gusset, messing up the rhythm of the seed stitch. Finally, I adjusted the pattern, substituting some PFB for KFB and some (P,K) for (K,P) repeats. Seems to have worked. 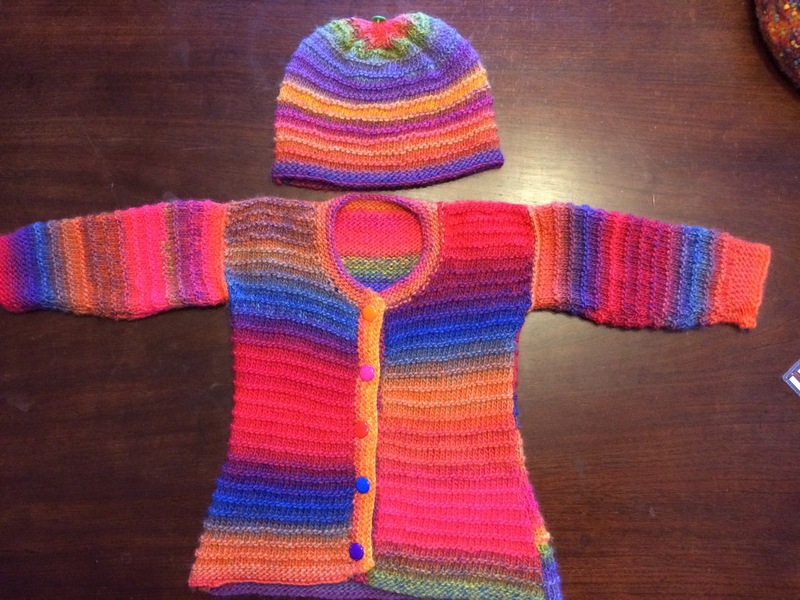 Marcia’s latest creation is a striped cardigan for a lucky baby-to-be. After finishing the neck at our last class, the only thing she’s got left to do is graft the sleeves to the body (underarm grafting, what a concept!) and add some buttons. See the yarn near the neck? That’s all she had left — yet again, playing a high stakes game of Knitting Bind-Off Chicken. Who says knitters aren’t risk takers?! I’ve said it before, and I’ll say it again, I love teaching knitting. One of the best parts is watching a knitter, novice or one with experience, work through a project — deciphering a pattern, fixing the inevitable mistakes, and finally finishing. First up, Debbie, a beginner whose patience, good humor, and perseverance are remarkable. She has an eye for her work, which means she can spot mistakes quickly. And, as I say in every class, every knitter — even the most experienced– makes mistakes. 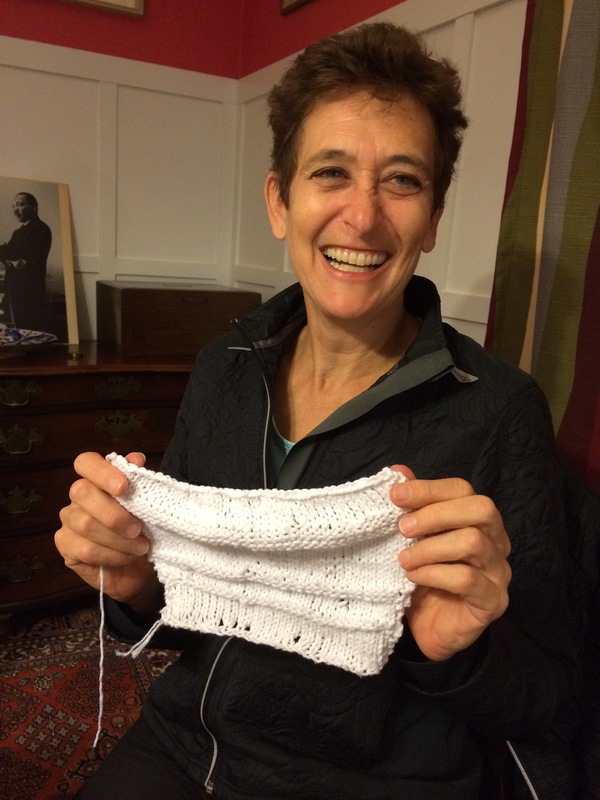 Debbie started with a small cotton washcloth, my go-to first project. She’s now working on a scarf (more on that in a future post). Next, there’s my down-the-street neighbor Marcia, who’s zipping through projects like a whirling dervish. (Do they knit?!) 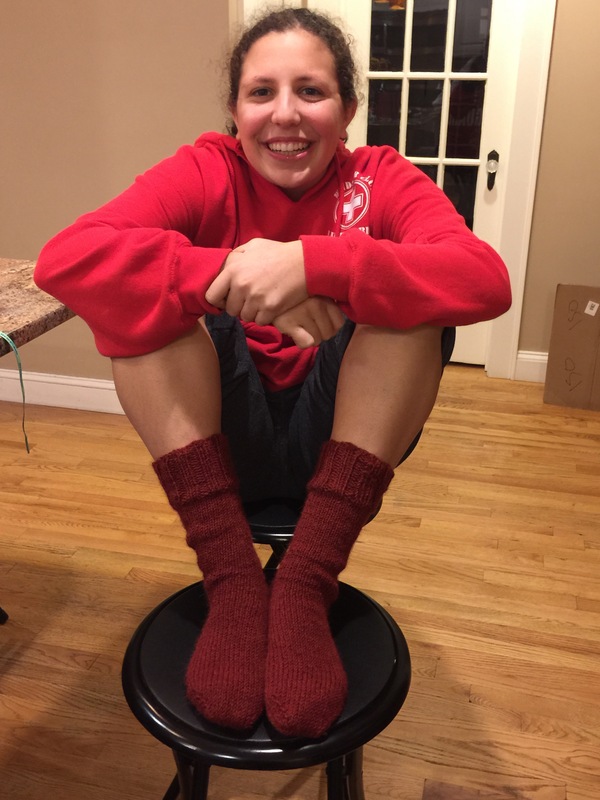 Her first socks were finished just in time for teen daughter’s birthday. As you can see, she loves them. As the mother of two teenagers, Marcia’s become a late-night knitter whose found the soothing benefits of knitting while waiting up for the safe return of said teens. 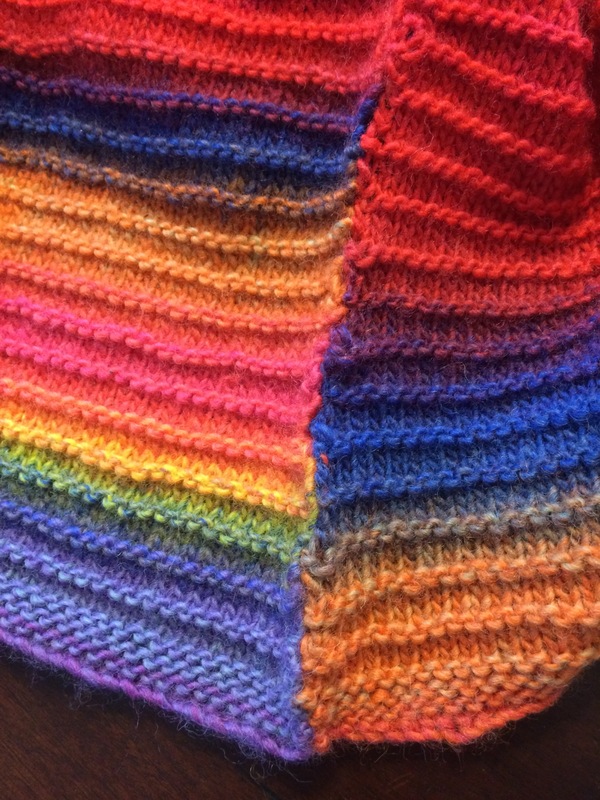 She recently completed a lovely and deliciously soft chromatic cowl. 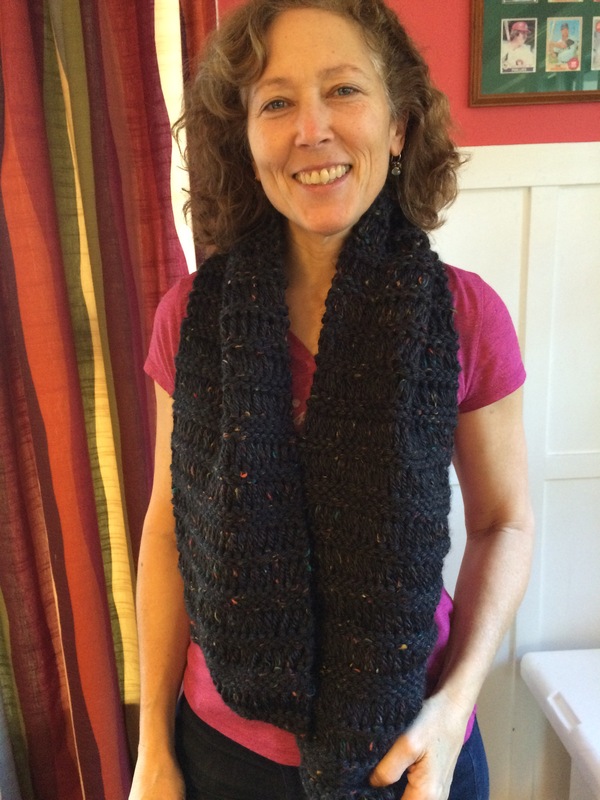 In time for Christmas giving, Pam completed a dropped stitch scarf for her teen son. He’s not usually a scarf wearer, but after holding this soft beauty, he declared that he’d definitely wear this one. Fearless Knitter Gillan arrived at class Tuesday morning with her Flared Baby Sweater nearly finished. She’d ripped out the button bands after her first attempt and had re-knit to her satisfaction. But she wasn’t happy with her seams, which were bumpy and looked inside out. “What did I do wrong?” she asked. Turns out she hadn’t really followed the Mattress Stitch instructions that I’d thrown into her hand at the end of the last class. She’d used a whip stitch, which doesn’t lie flat, and had seamed stitches too close to the edge. Since she’d put a lot of work into this beautiful creation, she readily ripped out the side and arm sleeves and started again with a one-on-one Mattress Stitch tutorial. Although she felt her progress was slow (which it wasn’t, but it felt that way), she was very pleased with the results. This side-by-side comparison shows the difference. Next step – and finishing touch – after seaming will be button selection. I recommended 5 buttons of different colors, picking up on the fiery rainbow of the Gina yarn. What do you think? There are few life events better than becoming a grandparent. At least, that’s what new grandparents tell me. It’s not a transition I expect to be making anytime soon. My dear friend Pat is justifiably besotted with her first granddaughter, a lovely, bright-eyed sprite born in mid-May to Pat’s son and his sweet wife. As Pat’s own birthday approached last month, I pondered how to mark that occasion and decided that a baby sweater would be the perfect gift. I know, I know, it’s not an item she can use herself, but what’s a gift anyway but something with personal meaning that’s given with love? Although the Baby Steps Cardigan is knit entirely in garter stitch, with nary a purl in sight, the construction is clever. I learned how to do a provisional cast-on (used white “waste” yarn), so I could pick up and make the sleeves. I just love the hues of the Mermaid colorway in the Manos Silk Blend. The back is knit from the center out with regular yarnovers that create a star burst (of sorts). Did I mention how much I love the colors? Choosing the right button took a while. I was drawn — as I usually am — to the blues and purples, but they didn’t stand out as much as the smooth, lemony one that I finally selected. I think the birthday girl will be pleased. I’m a proponent of full immersion blocking. In my mind, steam or a spritz just doesn’t give yarn the chance to “bloom” in the way that a good soak does. After binding off the Baby Steps Cardigan yesterday, I plopped it into a big mixing bowl that I’d filled with tepid water and a few drops of Eucalan. Why the mixing bowl? Because every sink in our house, except for the big kitchen sink, is missing its stopper, making them all unsuitable for filling. Why we’re a stopper-less household, I don’t know, but there we are. I left the sweater on top of the water and returned a couple of hours later to discover it had sunk nicely and was thoroughly soaked. After a couple of swishes with new water, I rolled the sweater into a towel. I gave it some good squeezes and shaped it on a dry towel, where it’s now drying and resting. The photo doesn’t do justice to the lovely colors, but I’ll remedy that once it’s truly finished. Next step: find just the right button. What’s your take on blocking? And what’s on your needles these days? I can’t remember what I used to give as baby gifts before knitting. As soon as I learn that a friend, colleague, neighbor, or family member is expecting, I immediately begin to think of what I can knit for the wee one. A hat is lovely and relatively quick to make. Blankets have a longer useful “life” since it takes years for a baby to outgrow a blanket. All three of my children had special blankets (none handknit) that they fondled, carried, draped, and loved for years and years. My youngest still has remnants of his lovely soft woven blanket on the bookshelf near his bed – a childhood version of the Shroud of Turin! Sweaters are somewhere in between. Depending on the size, they fit the baby for longer than a hat. And they almost knit up faster than a blanket. When I learned that a coworker was expecting her first child, after several years of trying, I just had to make a sweater. Every time I knit — whether at a hockey rink, basketball court, medical office, or curled up in the rocking chair keeping company with a late-night homework doer — I thought of this child-to-be. “You are so lucky to be born to such loving parents who’ve waited so long just for you,” I’d silently whisper into each stitch, imagining the finished garment as a talisman of sorts, something that could gird this tiny person in those first weeks of life with a special strength that might last for years, long after she’d outgrown the garment. It’s my second Puerperium Sweater (by Kelly Brooker), named for the period immediately after a baby’s birth. I made a striped one last year, and this time chose a solid dusty grape — my description, since I can’t find the yarn label — and some delightful buttons that remind me of sprinkles on frosted donuts. Tessa arrived last week and is as perfect as perfect can be. I was delighted to see that she was sporting a handknit hat in her first day of life. When my children were first learning to skate, I took them to a community rink for a lesson. They spent the entire first lesson falling onto the ice, flopping onto the ice, protected by their snowpants and jackets, and learning to get up. “On your hands and knees and bark like a dog,” the teacher commanded. “One knee up, and then the other.” Brilliant teaching. Everyone falls at least once, and if you can’t get up, you’ll never learn to skate. Kind of like knitting. Unless you learn how to fix mistakes, you’ll never learn to knit — or you won’t learn to enjoy knitting. Mistakes are inevitable. Like these purl stitches that I discovered on this sweater for a colleague’s baby-to-be. I didn’t notice the errant purls until a few rows later, of course. With a crochet hook, good lighting, and a few calming breaths, I slipped the stitches of each vertical row, one by one, and then “re-knit” them with the hook. Until each purl had been turned into a knit. Problem solved. Move on to the next row. I got a new neighbor just before the New Year when young Parker arrived into the world. What perfect timing since I’d finished my quick and sparkly scarf and was on the look out for a new project. I’m a sucker for babies and a cleverly designed knit. This one fit the bill. It’s knit in one piece. Nary a seam on the whole thing. The Yarn Harlot was my inspiration yet again. 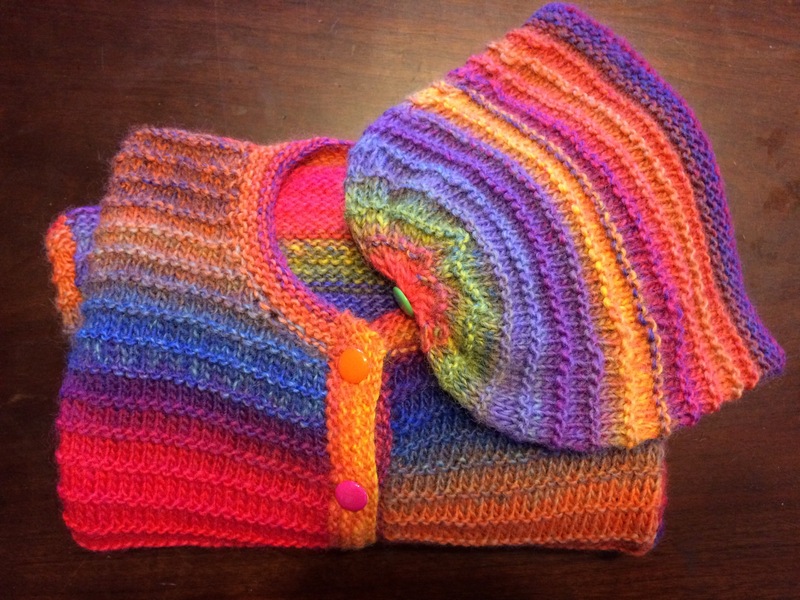 She knit several kimono-style baby sweaters last year while awaiting the arrival of a friend’s baby. I loved the style — no over-the-head wrestling needed since it buttons up the front side. Plus it has a few clever-but-not-difficult design features and stitches which always makes a project more intriguing. It’s called the Puerperium Sweater (by Kelly Brooker), named for the period immediately after a baby’s birth. I was running a bit late since wee Parker had been around for a while, but that didn’t faze me. I even managed to find some cute buttons to complete the look. I used Cascade 220 Superwash in Aran and Navy. I hope he hasn’t outgrown it already….